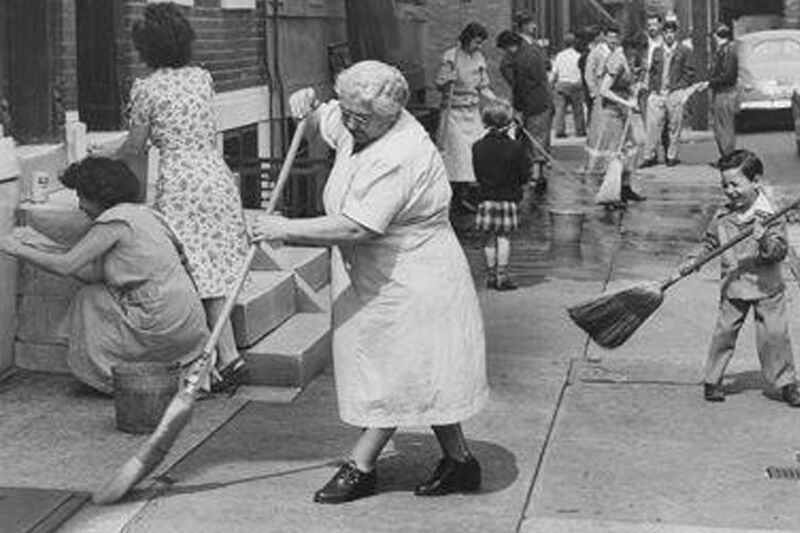 Keeping the sidewalks clean in South Philadelphia used to be a family affair. Hearing this city being called Filthadelphia is embarrassing, but apparently not embarrassing enough to drive its elected officials to take the dramatic steps necessary to keep streets clean, or to motivate more residents to stop littering and report illegal dumping in their neighborhoods. Philadelphia isn't the filthiest city. In fact, Travel+Leisure magazine dropped it from No. 2 to sixth on its list of America's dirtiest cities. Still, according to a recent Inquirer and Daily News report, calls to the city's 311 service with complaints about dumping and trash tripled from 2010 to 2017. Most urban areas with large populations have a hard time with grime. But when you're competing with other cities for jobs like the ones that a second headquarters for Amazon would produce, you want to look like a place where people want to live and work. Mayor Kenney knows that. He appointed a Zero Waste and Litter Cabinet in 2016, which set goals to reduce the city's waste and increase its recycling output by 2035. But while the interdepartmental task force has collected a lot of data that will help, it has yet to make much of an impact on the city's trashiness. Plastic bags and bottles, Styrofoam cups, and assorted other detritus still blight sidewalks, gutters, streets, and yards – even within the historic district. That's not what you want tourists to remember about Philadelphia. Kenney said during his 2015 mayoral campaign that he would bring back the street sweeping that was routine decades ago, even though it would require residents to temporarily move their parked cars. But the mayor gave up the idea after South Philadelphia car owners complained after a brief return to street sweeping there. Bringing back weekly street cleaning would cost about $12 million to purchase equipment and up to $5.2 million annually for personnel and other costs. But that expense, and the hassle of getting people to move their cars, apparently means street sweeping won't make a comeback in Philadelphia. That decision is questionable when weighed against the intangible costs to a city awash in trash — including civic pride — and tangible costs, like decreased property values, crime, and visitors too repelled by our mess to come back. But there are other steps Philadelphia could imitate to clean up. Washington, D.C., for example, passed a ban on Styrofoam food packaging in 2014 because that waste made up much of the trash polluting the Anacostia River. Several cities ban the plastic bags that end up floating in the air or dropped on the ground, including Chicago, Los Angeles, San Francisco, and Seattle. Five-cent fees are charged in Washington, New York, and Portland, Maine, for every single-use bag — paper or plastic — handed out to customers. The bag fee is 10 cents in Boulder, Colo. If the cost to consumers didn't stop Philadelphia from imposing a soda tax to alter people's behavior, it shouldn't stop it from imposing a bag fee to reduce litter. Changing the public's mind-set is crucial to the success of any anti-litter campaign. Trash Free Maryland, which coordinates independent anti-litter efforts in that state, says 40 percent of people admit they litter, mostly out of laziness, but some because they're in a bad mood and don't expect to be caught. There are two proven ways to change human behavior — reward and punishment. On the punishment side, the city should increase the 37 SWEEP officers who issue tickets when trash laws are violated. Just as it is with other law enforcement, a larger police presence will make people think twice before dropping litter or leaving trash in their yards. The city also should increase the 50 CLIP personnel who clean vacant lots. On the reward side, the city needs to improve its Philacycle program, which gives points to residents who diligently recycle. The points can be redeemed for various items, but mostly for magazine subscriptions. Hard cash would be a better incentive. The local Clean Air Council also has a good idea in the rewards category — give residents a share of the fine paid by violators when they report illegal dumping in their neighborhoods. The mayor promised to make cleaning up the city a priority. He needs to do more to fulfill that promise. Meanwhile, every district City Council member should have an action plan to clean up his or her district. This city doesn't have to be Filthadelphia, but shedding that nickname will take a lot more effort — by everyone.